Hair oiling treatment with corn oil can be done in several ways, depending on the effect we want to achieve. Warm up a few drops of corn oil in your hands and apply it to dry hair and scalp. Leave on the oil for more or less one hour but bear in mind that the longer the oil stays on hair, the better and more intensive action it will give. Therefore, it would be perfect if you could leave the oil for the whole night and shampoo hair in the morning. Corn oil is applied to slightly damp (not wet) hair. In this case you shouldn’t keep it long – one hour is enough. Then, you must wash your hair with a delicate shampoo. 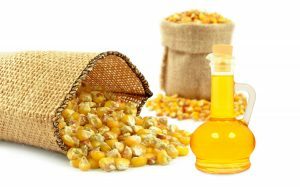 Corn oil will be also a perfect serum for hair ends protection. You apply it exclusively to hair ends after drying and styling hair. Corn oil (similarly to other natural oils) can stay on hair and scalp for a really long time. If you don’t have time for a long treatment, you can add it to hair mask or conditioner that you usually use after washing your hair. In this way, the oil will enhance the performance of the conditioner. 5. Conditioning preparation for hair. It is common especially in case of very damaged hair: you cannot tame your strands. Hair is frizzy, unruly and you cannot find the way to make it smooth. You should reach out for a corn oil which will make your strands smooth and easy to style. Apply the oil to the mid lengths and ends of hair; don’t apply it to the scalp.